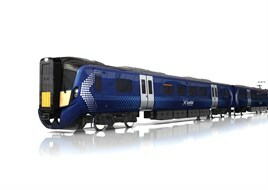 Hitachi Rail Europe and Abellio have signed a contract for the provision and maintenance of 70 new electric multiple units for the upcoming ScotRail franchise. The 46 three-car and 24 four-car AT200 EMUs are financed by Caledonian Rail Leasing, which is a special purpose vehicle created by SMBC Leasing. The first seven EMUs will be constructed in Hitachi’s Kasado factory in Japan, with the remaining 63 built at Newton Aycliffe. Abellio Chief Executive Jeff Hoogesteger said that 24 AT200s would arrive by late-2017 and the remaining 46 AT200s would arrive by December 2018. The deal includes a ten-year maintenance deal, with plans currently in place to stable and service the trains at depots in Edinburgh. The trains will be used on the Edinburgh-Glasgow Queen Street and Stirling-Alloa-Dunblane and will enter traffic in late 2017. For more on this story, see RAIL 771, published on April 1.